Welcome! I hope you are enjoying the New Annual Catalog blog hop that my friends and I have put together for you! Stampin' Up! is celebrating their 30th year! How awesome is that?!? We are focusing on the new stamps in the new catalog. If you are hopping in order you just came from Stamps & Scraps with Yapha. She used a new background stamp called Handwritten. I love her birthday card! You could be going through the hop backwards, in which case you just came from Tinkerin' In Ink with Tanya where she used the Tropical Chic stamp set. Aren't her projects fabulous? Either way, it doesn't matter. We are all linked together so you can see all the wonderful projects using some of the new stamp sets! The new stamp sets in the catalog are amazing! I had a hard time picking one set to focus on. I decided to go with Rooted in Nature. It's a pretty amazing set that focuses on nature (well, thanks for that Captain Obvious!). Abi was over helping me pick out colors. She always challenges me! I love her color choices but sometimes they wouldn't be what I pick out for a set. Take this first card for example! I made it work but oh, how I struggled! The leaves all have Wink of Stella on them. The shimmer in real life. This next card wasn't as much of a challenge even though the colors are even brighter. 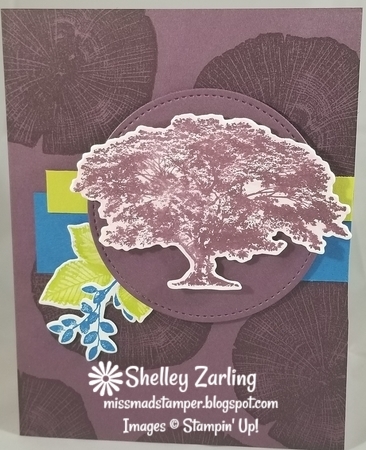 I used the large tree stump stamp as a background, stamping it several times. My last card was the first one I made when I sat down to create. I sponged the sunset with Mint Macaroon, So Saffron and Rich Razzleberry. 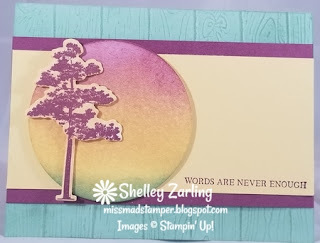 After I stamped and cut the tree, I sponged So Saffron on it so the white wasn't so stark and that it would blend into my sunset better. And last but not least is my set of scrapbook pages. I need to get a better picture of them! I will do that and share it with you on Monday. I will also have close ups of these two pages on Monday. Now you are off to check out Tanya's or Yapha's creations! Enjoy the rest of the hop!